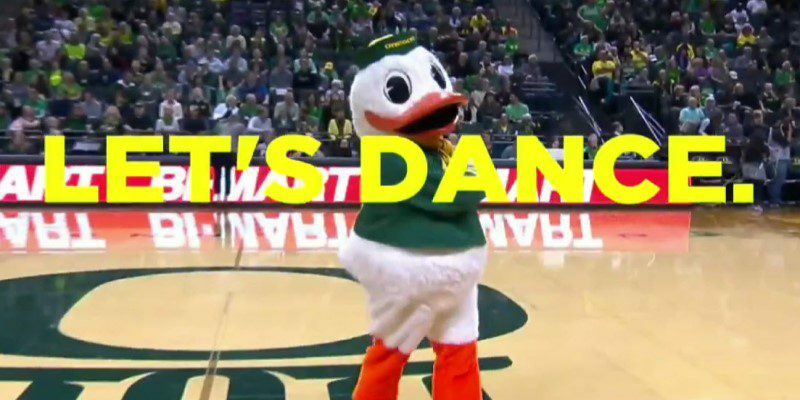 It’s April, and the Oregon women are still dancing! Can they continue their historic run and keep the magic going for a little while longer? We’ll see how everything unfolds tomorrow, but for now, here are 10 things to note before the big game. Baylor has reached the Final Four by winning all of their tournament games by at least 25 points. This has only happened twice before (2010 and 2013), and UConn went on to win the title both times. Baylor is the nation’s number-one overall seed and cruised through the Greensboro Regional to reach its first Final Four since winning the 2012 national championship. The Bears (35-1) went undefeated in the Big XII and have won 27 straight since their lone loss of the season at Stanford on Dec. 15. 3) What Makes Baylor so Good? Coach Graves and his prize pupil. Baylor leads the country in numerous statistics. Most importantly is field goal defense, due in large part to their size and ability to rebound and block shots inside. Lauren Cox is one of the best shot blockers in the country, and she, along with Kalani Brown,average over eight rebounds per game. Brown and Cox are Baylor’s top two scorers, but Juicy Landrum is their best three-point shooter (40.5 percent) on the team, and she and Chloe Jackson both average over 11 points. The aforementioned Kalani Brown (6’7″) and Lauren Cox (6’4″) are the keys to Baylor’s success. The duo of bigs lead the Bears in scoring, rebounding and blocked shots. The latter two categories being areas of sheer dominance by Baylor entering the women’s Final Four. Brown and Cox achieve this by pushing the pace in transition, getting in position to capitalize on their size by taking high-percentage shots on offense, and preventing opponents from doing the same on defense. The Bears take very few three-pointers and rely on Brown and Cox to dominate the paint, which allows them to get back on defense with less concern about the opponent pushing the pace in transition. 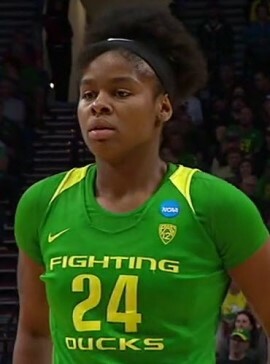 The Ducks could try to neutralize the size of the Bears by shooting more three-pointers, but this can create longer rebounds, leading to more transition opportunities for Baylor on offense, where Brown and Cox have an edge over Ruthy Hebard. The coaching staff celebrates ticket to the Final Four. The Ducks enter Friday’s Final Four matchup leading the country in three-point shooting percentage (41.7) and have four players shooting over 41 percent from behind the arc. Erin Boley’s 43.5 percent leads the way, with Sabrina Ionescu (43.3 percent) not far behind, and Satou Sabally and Maite Cazorla providing reliable support from long range as well. Stanford, the only team to beat Baylor this season, made 13 three-pointers (compared to only 10 two-pointers) when the Cardinal beat the Bears 68-63 back in December. Baylor and Oregon both played Arizona State, Stanford and Cal this season. The Cardinal beat both teams. 68-57 over UConn. After losing to Stanford, Baylor quickly reasserted itself as a legitimate contender by beating then top-ranked UConn on Jan. 3 in Waco. The Ducks have great wins against Mississippi State (twice) and Stanford. 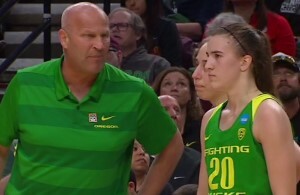 While the Ducks’ all-everything guard Ionescu is projected to go first in the WNBA Draft (assuming she enters), guard Cazorla is also projected to get drafted in the third round. The senior was a first-team All-Pac-12 selection this season. She averaged 9.8 points, 4.4 assists and 1.05 steals per game this season. She also ranks 10th nationally in assist-to-turnover ratio (3.10). Ionescu is seventh at 3.28. Ruthy Hebard is an inside force. The Ducks have a tall task ahead of them, but this year’s group has proven that they’re not ones to back down from a challenge. With just one game separating them from a chance to compete for the ultimate prize, expect the Ducks to bring their ‘A’ game tomorrow afternoon. Chris Brouilette, the FishDuck.com Volunteer editor for this article, is a current student at the University of Oregon from Sterling, Illinois.